This photograph has been scaled down; full resolution photograph is available here (2,081 by 1,705 pixels). Cpl Corletti & Pvt Robles ought to practice bringing magazines for their Thompson M1A1’s or all they’ll have will be expensive clubs. In 1940 the US Army ordered around 20,000 of the M1928,.45 Caliber Thompson Submachine Guns. The weapon used a 50 or 100 round drum magazine, and fired the same round as the M1911,.45 Caliber Pistol. Another order followed for 319,000 in 1941, in April of 1942 a simpler model called the M1, was followed by another model called the M1A1. Both weapons used the 20 or 30 round stick magazine. 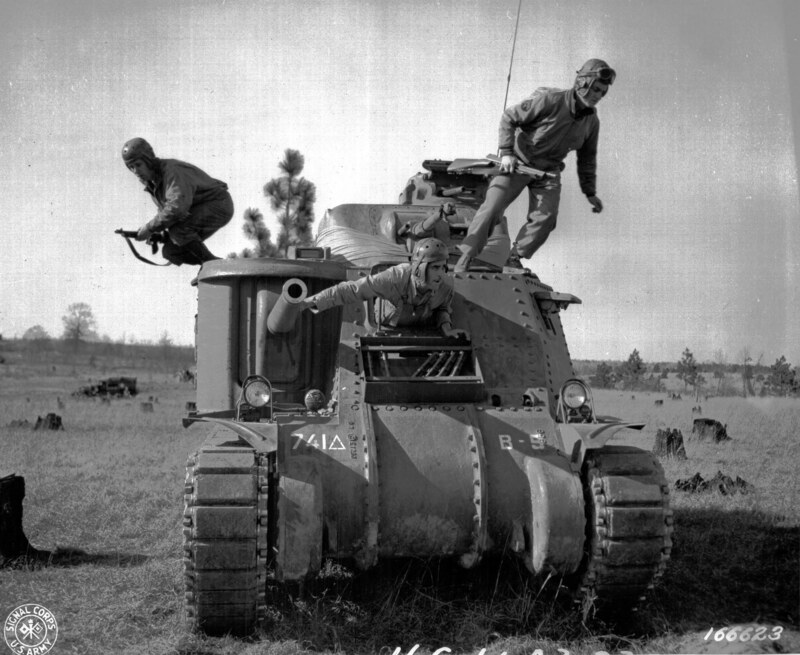 Our M-3 Lee tank crew is carrying, the M1 model. During WWII, over 1,700,000 were produced. Could be that because they were in a training environment, they didn't have them in the tank. I imagine they were in high demand in combat in '43. Probably only a few spares in CONUS based units for use in live fire training. just out of curiosity. anybody know if these three soldiers survive the war?